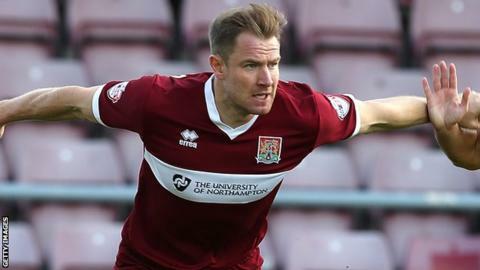 Northampton Town's Kelvin Langmead is hoping for an injury-free season having struggled since the end of 2012-2013. The 29-year-old made his first appearance of this campaign in the 2-1 defeat by Burton Albion, having only played three times last season. "I ended up with a tendon tear in my Achilles because I was overcompensating for my knee injury. "I'd been lucky in my career with injuries. Hopefully I can move on now," Langmead told BBC Radio Northampton. "You don't get fully match fit until six to eight games into the season, when you're playing on Saturdays and Tuesdays. "Consistency will come and, when it does, we'll take the league by storm." "For the stage that I'm at, I'm really happy to be involved." Club captain Langmead was a crucial player for Northampton as they reached the League Two play-off final two seasons ago, scoring eight goals in 47 appearances from centre-half. He was used from the bench as a striker against Burton, having played that role earlier in his career for Shrewsbury. "You'd have to ask the manager but I'm just happy to get out there, whatever role it is," he said. "We've got some fantastic centre-halves, as we have strikers, so it's not easy to get into the team at all." The Cobblers are currently ninth in League Two, having not managed back-to-back wins since the start of September. Langmead is confident that their inconsistent form will change and lead to a successful season, after narrowly avoiding relegation in 2013-14. "The league is tight," he added "It's a new group and the more we play together, consistency will come, and when it does, we'll take the league by storm."